Available in silver/black (AL), red/black, blue/black (BL), yellow/black (YL), green/black (GN), and black/black (BK). 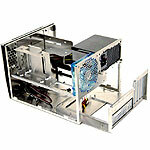 Standard Micro ATX/Baby AT, incl. 420 Power Supply. If you are looking for a PC that is compact and dynamic that you can just grab it and go, then this Apevia X-QPACK is your perfect choice. 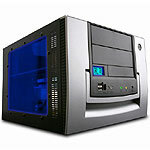 The X-QPACK is designed with the idea of giving users to choose any Micro ATX motherboard and components in the market to build their own compact PC. With a built-in ATX 420W power supply, 5 x drive bays and a 120mm fan, this X-QPACK is powerful, cool yet quiet. Stylish, portable, dynamic and cute, Apevia X-QPACK has it all. The X-QPACK Portable Case from Apevia allows you to pack the guns of a big baller case in a compact, lightweight, portable package. Fully aluminum chassis construction provides strength and stability while helping dissipate heat and reducing weight. A stylish and function front bezel houses many convenient features such as a temperature monitor, high speed I/O ports, and even a handle for easy transportation. 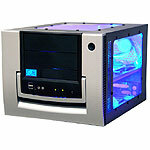 The top and sides of this case boast clear acrylic windows allowing bystanders a peak inside your machine. 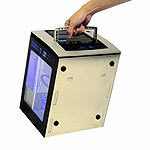 The case features a removable motherboard tray for easy installation of Micro ATX mainboards. A 420W PSU, room for five total drives, and 4 expansion slots allows you to deliver the power punch a larger case provides. 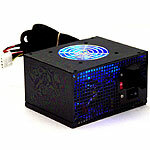 A powerful UV Blue LED 120mm chassis fan and 80mm PSU fan keep the air moving inside this case. The Apevia X-QPACK Portable Case proves that sometimes less is more! Dimensions (DxWxH) 13.8" x 11.2" x 9"